If you have access to the end user's device, it can be helpful to inspect network traffic when troubleshooting a problem with the Geocortex Mobile App Framework. The Geocortex Mobile App Framework for iOS can optionally log all network traffic to a network log file. This feature is disabled by default for performance reasons. We do not recommend enabling network logging for normal use of the App. This feature requires at least iOS 10, and is not available in the Android nor Windows versions. If you do not have at least iOS 10, you can still inspect remote network traffic with Fiddler. On your iOS device, open the iOS Settings . Scroll down and tap Geocortex. 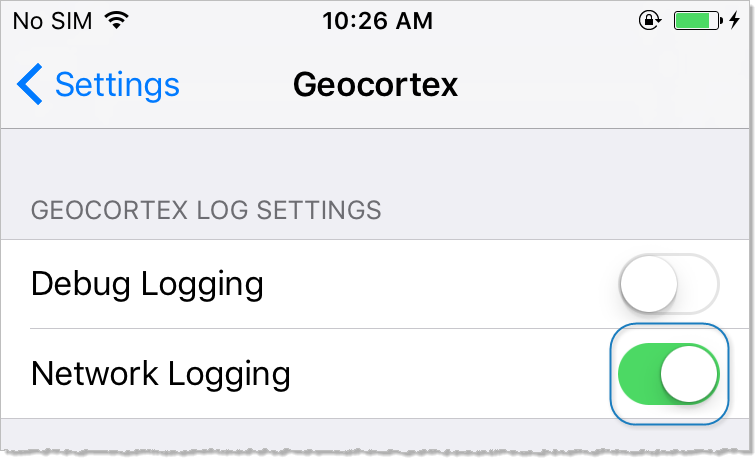 Under Geocortex Log Settings, tap the slider beside Network Logging. The slider becomes green, indicating network logging is enabled. When you use the Geocortex Mobile App Framework, a network log file keeps track of all network requests. As this feature requires at least iOS 10, this setting has no effect in older versions of iOS. When your device appears in the toolbar, click the device . A sidebar appears to configure settings. In the sidebar, click File Sharing . A new page appears to configure file sharing. At the bottom of the page, the File Sharing section lists Apps from which you can save files. In the Apps list, click Geocortex . The Geocortex Documents list appears. In the Geocortex Documents list, click network-log.txt . Navigate to a folder on your computer where you want to save the network log file, and click Select Folder. The network log file is saved to the folder you selected. The Geocortex Mobile App Framework also keeps two archived network log files in the same location. When a log file exceeds 10 MB, older log entries are moved in the following order: network-log.txt, network-log.0.txt, network-log.1.txt, and finally removed. To use the network log, you must have at least iOS 10. The network log is not available in earlier versions of iOS. However, you can inspect remote network traffic with a third-party web-debugging tool called Fiddler. Fiddler cannot inspect network traffic that is local to the iOS device itself, that is, requests to localhost or 127.0.0.1. On a computer that is on the same network as your iOS device, download and install Fiddler. In the Fiddler menu, click Tools, and then click Telerik Fiddler Options. The Telerik Fiddler options window appears. Select the Allow remote computers to connect checkbox. Note the Fiddler listens on port number, as you will need this port number later. If prompted by the firewall, allow remote access for Fiddler. Otherwise, you may need to manually edit the firewall settings. On the iOS device, open the iOS Settings. Tap the Wi-Fi connection that connects the iOS device to the same network as your computer. Scroll down to HTTP Proxy and tap Manual. In the Server field, type the name of the computer with Fiddler installed. To determine the name of a Windows computer, hold down the Windows key and press the Pause/Break key. In the Port field, type the port number you noted earlier when configuring Fiddler. Make sure the Authentication setting is disabled. On the computer, run Fiddler. If you are prompted by the computer's firewall, allow remote access for Fiddler. 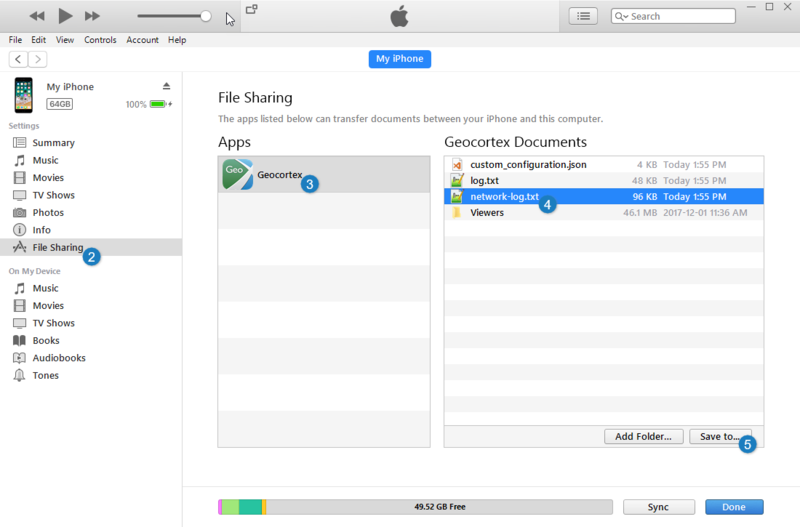 On the iOS device, start the Geocortex Mobile App Framework. Use the Geocortex Mobile App Framework. Fiddler displays the remote network traffic. To display more information about a particular network activity in Fiddler, click the activity and then click the Inspectors tab.